Michelangelo Bacchus is the very first full statue by the greatest sculptor ever. Today, it is on display at the Bargello Museum. It was made in 1496-7 in Rome, for Cardinal Raffaele Riario, an art collector. Michelangelo Bacchus will pave the way to the young artist to receive another commission, which will give him fame all across Italy: the Vatican Pietà. Not many know the story behind Michelangelo Bacchus and how the artist got to work for Cardinal Riario: it’s a very interesting story, so let’s read on. Lorenzo de Medici “The Magnificent”, patron and protector of Michelangelo, died in 1492 and shortly after, in 1494, the Medici family was banned from Florence, where Girolamo Savonarola, a “fundamentalist” Dominican friar, took the power trying to create a Catholic dictature. Michelangelo, educated in Palazzo Medici by neo-platonist philosophers, didn’t like the new flow of events in his own city and started to travel across Italy. In Rome, an art merchant asked Michelangelo to make a statue representing a sleeping Cupid. The merchant fraudulently sold the statue to Cardinal Raffaele Riario, who loved to collect ancient Roman statues for his garden. After discovering the cheat, the Cardinal wanted to know the artist who was so good to deceive him, a fine expert of ancient sculpture. 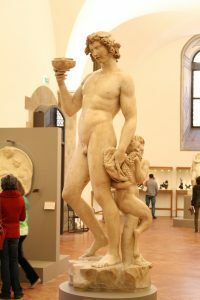 Michelangelo, just 21, was unaware of the fraud and the Cardinal asked him to make another work: a statue of Bacchus, resembling an ancient statue, for his collection. Cardinal Riario didn’t know who he was dealing with… Michelangelo was not like any other artist, ready to obey and create exactly what someone else suggested: filled with neo-platonic influence, Michelangelo would re-interpret Bacchus his own way. No doubt on his ability to represent the human anatomy like the ancient sculptors, but imitating was not in his DNA. 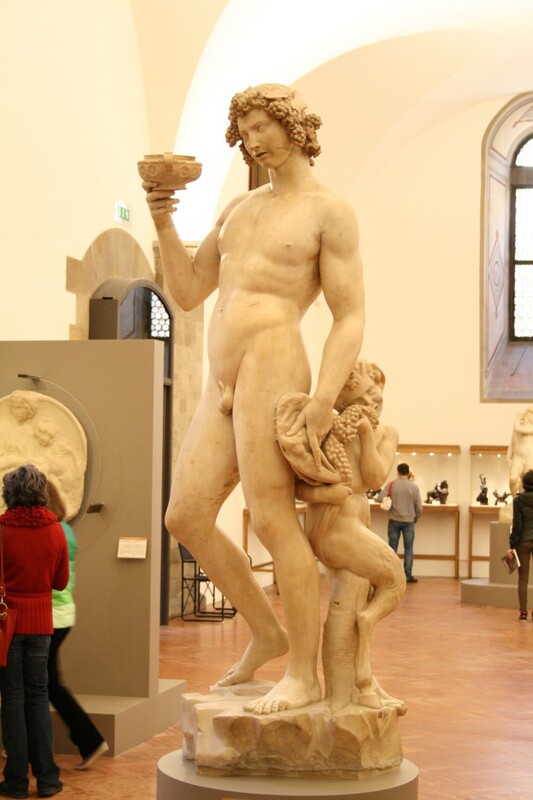 A drunk young man is what Michelangelo Bacchus looks like. Positioned as if he was losing balance, wine-belly, looking at the observer with and absent-minded look. To help sustain the weight of the statue, Michelangelo added a young satyr, covertly eating grapes behaind the left hand of Bacchus, which also holds a tiger skin, symbol of the God. This is how the great artist interpreted the Ancient Roman God of wine, giving him a human dimension. A masterpiece for us today: the first artist that not only can recreate the anatomical perfection of the ancient statues, but adds feeling and emotion. A failure for Cardinal Riario, who didn’t like how Michelangelo had subverted the ideal appearance of an ancient deity. The statue was sold to the Florentine banker Jacopo Galli and later to Francesco I de Medici Grand Duke of Tuscany. Michelangelo Bacchus was lacking the right hand. Afterall, the Cardinal asked for an imitation of a classical statue, right? We know because a drawing made in 1532-33 and another print made later show the statue without the right hand. We don’t know who added the missing hand and the cup of wine (nor when). Today, the statue is visible in Michelangelo’s room at the Bargello Museum. Although not considered as famous as his David or the Vatican pietà, this is a great work showing the strong personality of the great artist. A work that should be in Rome, but thanks to the intuition of Jacopo Galli was moved to Florence.